Cast copper-alloy handle lug from a vessel, probably a chafing dish. It has a circular loop, 16 mm in diameter and 4.5 mm thick, with a central perforation 7 mm in diameter. From one edge a short integral rivet projects, and there is a flaring collar at the junction of rivet and loop. 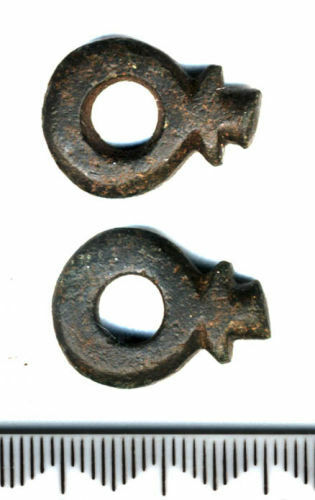 Although this object looks superficially like a swivel, as the rivet is distinctly oval in section (5 x 6 mm) it would not have turned freely within a loop. In addition, drop handle lugs are well-known from surviving chafing dishes and, occasionally, other vessels. A drop handle terminal was also found at the same time (sf7056) and the two could easily be from the same vessel. The rivetted attachment loop and part of the drop handle from a copper alloy vessel, probably a chafing dish. The handle has a rectangular section. A fragment of a drop handle and atachment loop from a late medieval or later chafing dish. The loop is 21.69mm long with an integral rivet.